The enhanced printing productivity afforded by the Konica Minolta Bizhub C454e printer illustrates the efficiency of this innovative product’s polymerised Simitri toner technology. Designed especially for Konica Minolta printers, this system for use in print production economises the printing process, so that performance is maximised and waste is minimised over time. The durable design of the Konica Minolta Bizhub C454e printer supports continuous print production, without the same downtime demanded of inferior printer products. 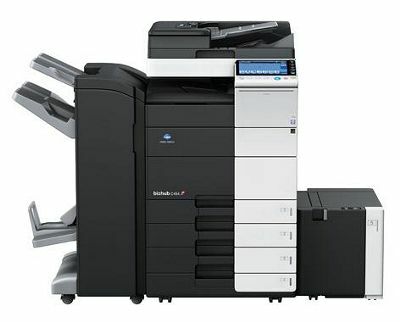 Developed by Konica Minolta the Bizhub C454e model printer is also a multi-tasker, with a Super G3 Fax option for high-volume fax transmission and reception. A simple control panel for scheduling printing jobs, at a 45ppm rate of print and copy output make production jobs easy to manage. Create incredible documents that standout from a crowd of competitors with the Konica Minolta Bizhub C454e commercial printer model, for offices of all sizes. This printer handles up to 3,000 sheet large capacity print production runs, and finishes documents with staples or punch kit assembly on-demand. Pages are bright with the Fiery Image Controller feature, for advanced colour management and print queue designating of printing jobs. While this printer is designed for fast, intuitive operation from a touch-screen console, programmable security and HID card features must be accessed by way of designated user credentials. The printer complies with the IEEE 2600.1 international standard for MFP and printer information security, yet the security features make this printer a more challenging printer selection for offices without dedicated IT security operations. The upside is that the seeming disadvantage of a complex system of security features is inevitably an advantage with the proper education. The large size and higher up-front cost of this printer means that small businesses or companies might not find it a realistic option.